CALIFORNIA GOLD RUSH (Dan Trimmer) Tetraploid (Sdlg. x Gold Baron) 23" M Re. Ev. 4 3/4" (Sdlg. 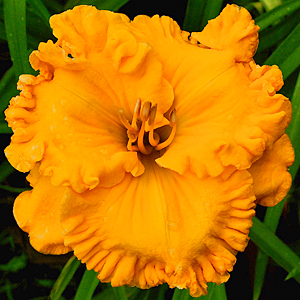 8-34) This super wide, ruffled, intense gold bloom is wonderfully pod fertile and a garden gem! The perfect blooms sit just atop the foliage. 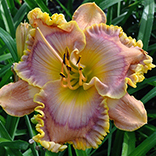 The form goes back to the Tetra Ruffled Masterpiece breeding from Gold Baron and the saturated gold color in this case is due to hybridizer's luck having worked in the orange and golds for many years. Typical bud count is 17 with a great deal of instant rebloom.